The oldest dairyman in the district was Simon M. Gundy who started his dairy business in 1920. Born and raised in Oakmont and Verona, he worked as a draftsman for Woodings Tool Works on Plum Street. In 1919, he and Mr. Gundy moved to Verona Road. There he started with one cow and delivered milk on his way to work at Woodings. 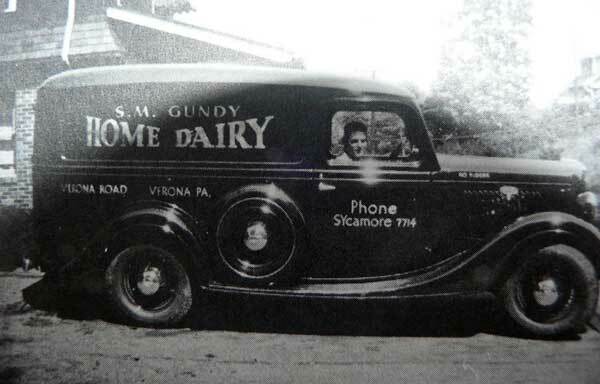 As his business grew, he devoted his full time to the dairy business and it was known as S.M.GUNDY HOME DAIRY. The business grew until he bottled over 400 bottles a day and employed 6-8 men and had several trucks. The dairy served Verona, Oakmont, Penn Hills, the schools in the area and many eating places. Mr. Gundy, (SIM) to his many friends, sold his dairy in 1946 and retired to (feed his chickens). He had to keep busy so he bought an ice cream machine and started all over again, catering to arties and friends. He and his wife, Flora, were the same age and both born on the same day September 18, 1882. The Gundy residence at 6615 Verona Road and also the buildings once used for the dairy. The barn has since been torn down. Mr. Gundy passed away July 14, 1955 and Mrs. Gundy on January 29, 1965.